Want a new Story for this Holiday Season? Us humans are funny … when we go ‘home’ (especially for the holidays) we can easily revert to the roles we’ve filled for years. And if our roles stay the same, the story is basically the same, or close to the same every year. Sometimes that is okay, other times it’s frustrating and we want things to change. I like this idea from the Monday Morning Memo for an idea of how to write a different story this season. 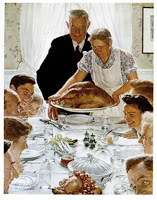 We Americans have idyllic, Norman Rockwell-type expectations of the holidays. We go home with an idealized memory of a place where everyone listens and cares and loves us for who we are, a place where we’re known and everything is okay. And what we find when we get there is our family. We’re never quite prepared for the selfishness of Carol, the laziness of Lee, the assertiveness of Sarah and the insensitivity of Bob. And Gary, well, he’s just a jackass. So this year I have a plan: Rather than trying to have a good Christmas, I’m going to make sure that everyone around me has one. My plan is to be silently thankful. Constantly, consciously thankful. I’m going to see past Carol’s selfishness and like her anyway. I’m going to accommodate the laziness of Lee. l plan to submit to the assertiveness of Sarah and understand the insensitivity of Bob. I’m even going to seek out Gary and show an interest in whatever he wants to talk about. If my plan is to serve rather than be served, and to give understanding rather than receive it, how can I be disappointed? I’m going to join Roy H. Williams and set a goal to be more thankful this season and to use that gratitude to help me serve those around me. This doesn’t mean I’ll be a doormat and allow others to walk all over me. No, to help others have a good season, I need to love myself as Jesus instructed, so I can love others also. Helping others means listening, doing acts of service and loving them. It also means making sure I’m not stressed out, so I can aim towards being constantly, consciously thankful. For some reason, it’s hard for me to be sleepy and thankful and kind to others – so sleep is key, along with eating well (give me a few dozen sweet cookies and ‘Carol, Lee, Sarah, Bob and Gary’ all tick me off) and taking time to “be still” before I hit the family scene will go a long way in helping me be grateful. Your thoughts … have you ever noticed if having an attitude of gratitude makes serving others easier? If you are aware about being more grateful, think you can write a different story (or at least change a few of the yearly lines/acts) this holiday season? I think attitude is key always … and this is a great reminder. When we have any kind of selfish attitude, wanting it to be about ME, to make ME happy, it invariably doesn't because we're surrounded by other selfish people. Your attitude will change everything for you and hopefully for those around you too!